Hijab Fashion Shop is a UK-based online store launched in March 2010. At the moment they have a large selection of summer hijabs, both plain and printed, as well as the usual hijab accessories; bonnets, pins, sleeves, etc. 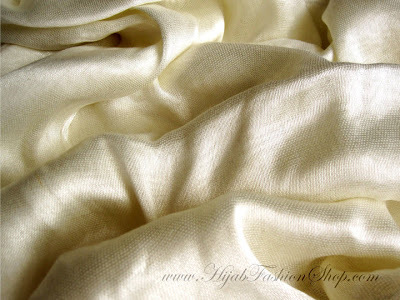 I was recent sent the Summer silky hijab in Ivory to review! I like the size of the hijab (190cm x 65cm), it's not too wide and long enough to wrap around about 2.5 times. The fabric is a little see-through so I'd recommend wearing a bonnet cap underneath. Apart from that though, the hijab is very soft and easy to shape without being bulky. It's versatile enough to dress up a simple outfit or to complement evening wear. However the fabric is quite delicate and tends to snag easily, so it's best worn without too many pins. The website has a nice selection of scarves and the customer service is excellent. This hijab comes in a lovely soft fabric and is ideal if you prefer to wrap your scarves without pins. Disclaimer: I received this hijab in exchange for my honest review. The opinions and thoughts expressed are my own and I received no other compensation for my review. As-salamu alaykum wa Ramadan Mubarak. Looks like a lovely Scarf!